Dawn Spencer Hurwitz has been around longer than most indie perfumers — long enough, in fact, that she recently began a "retrograde files" fragrance series, relaunching and re-imagining discontinued scents from her back catalog. She wrote in a recent blog post, "Passionflower Perfume Poems was a small collection that I started releasing around 1999–2000 with a young, ‘millennial’ audience in mind." Well, the Poems are back, with slight reformulations and name changes. I looked forward to trying a few because I remember them from the mid-2000s but I drained my sample vials years ago. First, here's Bluedaisy, formerly known as Daisy or Daisy Be Young. (I can guess why it would be difficult to re-release a fragrance under the name Daisy in 2017.) Its description asks, "What could be more summer-fresh than our sky blue tinted daisy scent? An airy spin on a fresh, grapefruit-y floral gourmand. It’s lively and softly sweet, with fresh and tropical fruit notes, green grass, as well as hints at warm candy floss mixed with fragrant woods in the drydown." Bluedaisy is a friendly and easygoing warm-weather gourmand that lasts well on my skin. As a "foody" scent, it's a sweet/tart composition that falls midway between a summer cocktail and a dessert: it has lots of sugared lime that gradually transitions into a soft citrusy musk with some very sheer cedar in the background. Another revisited Passionflower Perfume Poem is Poppy, or Poppy Be Wild, as I remember it. Poppy is "a spiced, fruity-floriental perfume with rich peach and fig leaf top notes that blossom into a fiery heart of jasmine-tea, carnation, and nutmeg. The dry down is a warm and enveloping base of amber, patchouli, clove tobacco, and musk." As you can guess, Poppy has a different feel than Daisy — sorry, Bluedaisy! It also reads as a different color, probably a deep burnt orange. To my nose it starts with some deep blood orange, then some pipe tobacco, then lots of clove and some sweet-and-spicy patchouli. I think I detect a bit of rose in the heart. The tonka and opoponax in the base push it firmly into oriental territory, but Poppy feels modern rather than vintage-y or "dressed up." It could be worn by women or men, for daytime as well as evening. I applied just a dab on a hot afternoon and I enjoyed the way it bloomed on my skin. Hurwitz has also re-released April (Be Spring) from the Passionflower Perfume Poems collection, and there may be more re-launches to come. In the meantime, I'm happy to revisit (Blue-)Daisy and Poppy and to find that I still enjoy them just as much as I did a decade ago; maybe even more, despite all the other things I've smelled in the intervening years. There's something to be said for that. Dawn Spencer Hurwitz Bluedaisy and Poppy are available in a variety of sizes and formats, including bath and body products; the 30 ml Eau de Parfum is $70 for Poppy and $80 for Bluedaisy. For buying information, see the listing for Dawn Spencer Hurwitz under Perfume Houses. 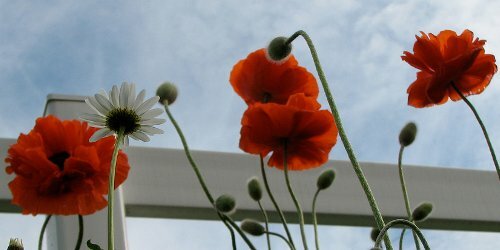 Note: top image is Daisy Among Poppies [cropped] by Audrey at flickr; some rights reserved. I don’t have any of the “old” Poppy, so I can’t do a side-by-side… but this version rings pretty true to my memory, and it’s really smooth and spicy-warm and just feels good! That is a great story Hajusuuri! There’s a lot on the website! Yep, she has created Voile de Parfum and other formulations that can be shipped beyond the US!